Protestants seem enamored with transplanting communal rites outside of both their ecclesial and liturgical contexts-- that is, taking them out of a worship setting and offering them individually. Whether it is communion at train stations or at home via skype, or Ash Wednesday around the dinner table because you're snowed in, we seem to look for any excuse to take sacred rites to the secular. Theologically, this is often tied to a sort of missional mindset, which observes (rightly) that Jesus didn't spend all his time in the Temple, but went out to meet people on the road, at the city gate, and at the well. In a North American context where fewer people are making worship a priority even once a week, it seems unreasonable to wait in church and simply hope people show up. In my own tribe, United Methodists, we will often cite John Wesley's bold step of preaching outside to coal-miners and other working class people of England at the beginning of the Wesleyan revival. This kind of sacred experience outside of church and among the people, the argument goes, is simply part of our Methodist DNA. The problem remains the same, however, because there is a basic category mistake. 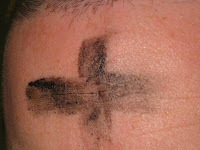 Ash Wednesday, like the Eucharist, is a corporate rite. Even in situations of pastoral need-- like, say, taking communion to the sick, or the woman who accidentally arrived early at my church last night-- these are exceptions to the rule for those who cannot be present with the community. That's quite different than seeking out those who could be in corporate worship and offering them a facsimile of the real thing. Ashes-to-Go is a capitulation to an individualistic culture that, however anecdotally meaningful to participants, ultimately undermines the creation of a Christian community in which worship is central. It is satisfying in the way that eating ice cream before dinner is satisfying: it meets an immediate desire but ruins the real experience of the family meal. I don't regret offering ashes on the go last night, but it reinforced my belief that Ash Wednesday, like Holy Communion, is a community experience whose individualistic expressions should be an exception based on pastoral need and not on convenience. I respect the desire to reach people outside of the walls of the church and the desire to try new things-- and indeed, some of my closest colleagues do this annually-- but I believe it ultimately misses the mark. His entire must-read post can be found here.